Learn how to dye your fibers, yarns, and textiles naturally with tips and techniques from dye master, Dagmar Klos in this video workshop. 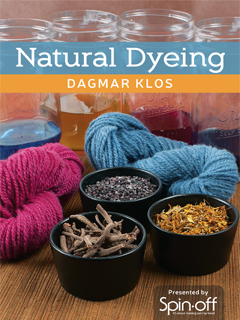 Learn how to dye naturally with Dagmar Klos! Who understands color better than Mother Nature? From quiet to riotous, nature’s color schemes are always harmonious, and natural dyes can be used to create beautiful, vibrant colorways. In this video, master dyer Dagmar Klos introduces you to the secrets of dyeing your fibers, yarns, and textiles with nature’s perfect palette. In her clear and friendly style, Dagmar offers indispensable information on equipment and supplies, types of dye, safety procedures, and record keeping. You’ll see how easy it is to use natural dyes, learn useful tips and hints, and gain a foundation from which to set out on your own natural dyeing adventures. Learn everything you need to know about natural dyeing in this 60-minute video workshop hosted by Dagmar Klos! This workshop is available on DVD and as an instant video download. DAGMAR KLOS is a dye master, fiber artist, and teacher. Since 1995, she has served as copublisher and coeditor of the Turkey Red Journal, a newsletter dedicated to natural dyes. In 2002, she received the Handweavers Guild of America’s Certificate of Excellence in Dyeing. Dagmar’s colorful woven scarves appear in Handwoven Scarves (Interweave Press, 1999), and have often graced the pages of Handwoven magazine. She lives in Chicago, Illinois. This video is very informative and excellent for someone who, like me, is interested in naturally dyeing fiber. Dagmar Klos provides clear descriptions, definitions, and demonstrations of how to dye fiber naturally and safely at home. I was interested in understanding natural dyeing techniques and considered purchasing another video class, but the reviews on that other class were not so good. I chose not to purchase the other video mostly because of those negative reviews and because this video was much more reasonably priced.